This is one book that I feel like I missed out on reading during my high school years, and I’ve always been sad about it; I’ve even owned a copy for at least 3 years, and I still wasn’t able to read it until recently, so finishing this was somewhat of a personal accomplishment for me. Not because it’s such a hard book or anything, but because this is a recent classic that I’ve been wanting to read for so long. It feels especially close to me, because while I am very much not related to any Native Americans, my grandfather lived in Spokane, WA for almost all his life, and he even lived on the Spokane reservation with his girlfriend for a large part of his later life, so it’s interesting to get a sense of the place my grandfather called home. First, I have to say that this book is lovely. It’s about a boy named Junior who lives on the Indian reservation in Spokane, and he decides to go to the “white” high school to try to build a future for himself. 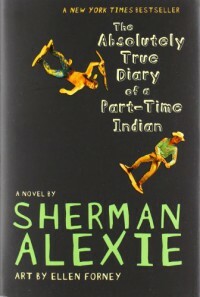 I was able to read through it quickly because it’s a pretty easy read and it is so, so entertaining and hits on some very real, true-life events that were inspired by Alexie’s own life. It’s wonderful that this book is out there for teens to read when they’re feeling like an outsider, because the main character is pretty much the ultimate outsider in a lot of ways and reading about his feelings about that and how he deals with it is somehow comforting. What makes this Absolutely True Diary of a Part-Time Indian a success is the fact that it covers everything. It’s funny and yet incredibly heartbreaking, reflecting real life in a way that most stories don’t even come close to, which I think is a reflection of its large autobiographical influence. It comes across as honest and genuine, which is something that is lacking in fiction sometimes, and which YA fiction especially needs. The illustrations are an added bonus and give further insight into Junior’s character and his overall mood at the time he’s “writing” his diary entries. They’re incorporated well and I loved reading Forney’s explanations for why each illustration was done the way it was. There’s a reason why this is such a classic, and I don’t know what I can say that others haven’t, except that I personally liked this a lot and think it belongs on the must-read lists of everyone, because it is such a powerful, wonderful story.